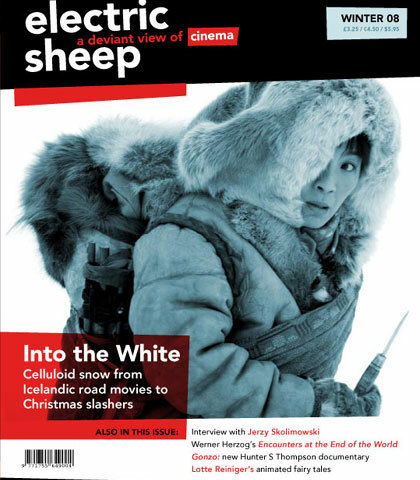 The winter issue of Electric Sheep explores celluloid snow with articles on Werner Herzog’s Encounters at the End of the World, Aki KaurismÃ¤ki’s Calamari Union, John Carpenter’s The Thing, Christmas slasher movies and cult Japanese revenge tale Lady Snowblood. 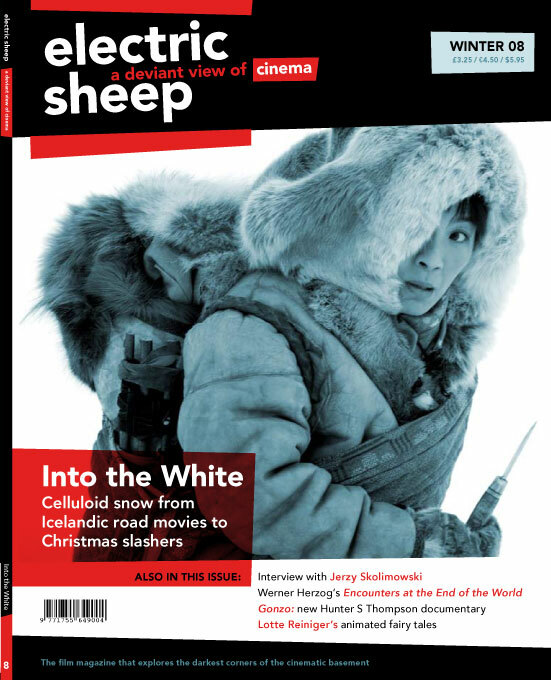 Plus interview with Asif Kapadia and Jerzy Skolimowski, preview of the London Short Film Festival, and a comic strip review of Kamikaze Girls! It is available from Wallflower Press for a 15% discount! Asif Kapadia’s tale of love and revenge in the Arctic Circle, Far North, triumphantly ends the cinematic year. Also out this month are BÃ©la Tarr’s long-awaited incursion into noir territory The Man from London, melancholy samurai tale Love and Honour and two documentaries on American icons, Gonzo: The Life and Work of Dr S Thompson and Patti Smith: Dream of Life. In the DVD releases, we have Lotte Reiniger’s exquisite animated Fairy Tale Films, 60s Brazilian master Glauber Rocha’s Black God, White Devil, psychedelic Polish fantasy Hourglass Sanatorium, Strangers on a Train-themed giallo The Designated Victim, George A Romero’s fascinating feminist horror Season of the Witch and documentary The Mindscape of Alan Moore. We have an interview with DA Pennebaker and Chris Hegedus about their documentary The Return to the War Room, which screened at Sheffield Doc/Fest last month. We celebrate the wonderful project of The Close-Up Video Library and preview the ICA cinema’s 40th anniversary season as well as the very exciting Wild Japan season at the BFI Soutbhank. And as 2008 draws to a close we review the best and worst cinematic moments of the year. In the Short Cuts we review the Cinema16 collection of world short films, and in the Film Jukebox we have The Pains of Being Pure at Heart, the New York indie pop band that is currently making even the most jaded critics giddy with excitement.